My mom, Maralyne Monsour, died at her home with our family by her side on September 12 just a few days short of her 73rd birthday. She was an amazing woman...so very strong, such a fighter, so beautiful (inside and out)...such an amazing mentor. Yep, I miss her a lot and her death is the reason for my absence from this blog. 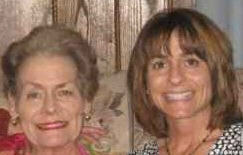 When I sit in front of my laptop, it often triggers memories of being with my mom for therapy, surgeries and recovery. Her ten year battle with cancer is inspiring. She's my hero. It's because of her brain cancer diagnosis in 2007 that I become a heavy user of Twitter for instant information, contact and mass notification on Mom's condition. Her passing is still really so raw that this post is a short "letting you know why I've been away" update and also a quick thank you to everyone that has helped me through my mom's passing. Thank you!